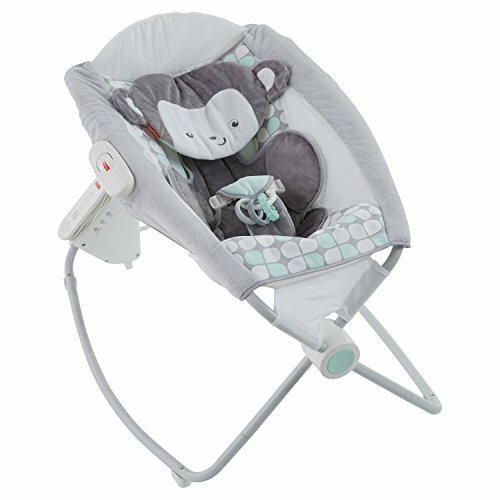 Your little monkey can drift off to dreamland in serene comfort with the soothing, hands-free rocking, calming vibrations, and soft, gentle music of this Deluxe Auto Rock 'n Play sleeper. With 12 soothing songs and sounds, a plush and supportive Sweet Surroundings Monkey seat pad, and two hands-free rocking settings for naptime or nighttime, this is the ultimate sweet dream machine. And its lightweight frame folds easily for storage or take along! Where development comes into play Sensory: Gentle motions, soft fabrics, and soothing music and sounds help stimulate your baby's developing senses. Security and Happiness: Gentle motions, music and sounds provide comfort and security for your little one.